Phosphine gas is a gas that is frequently used as rodenticide and insecticide due to its high diffusion capacity and the absence of residues in agricultural products. Since this gas is highly toxic, it is found in our country as aluminum phosphite tablets impregnated with clay, these tablets emit phosphine gas when they meet with the moisture in the air or gastric hydrochloric acid. Mortality rates in aluminum phosphite intoxications are 40-80% depending on the exposure dose. There is no control mechanism in the supply of aluminum phosphide tablets which are so dangerous and no information is given about the serious conditions that may occur during the use of these tablets. A 2 month old baby, whose family practiced drying pepper-eggplant, was reported to have been exposed to phosphine gas by inhalation, admitted to hospital with vomiting and cyanosis and lost his life within 24 hours. We present our case, who lost his life due to erroneous usage of aluminum phosphite, with additional emphasis on early diagnosis, treatment and gathering sample for toxicologic analysis, with corresponding forensic and medical documents. Fosfin gazı difüzyon kapasitesinin yüksek olmasından ve tarımsal ürünlerde kalıntı bırakmamasından dolayı rodentisit ve insektisit olarak sıklıkla kullanılan bir gazdır. Bu gaz oldukça toksik olduğundan preparat olarak kile emdirilmiş alüminyum fosfit tabletleri olarak ülkemizde bulunmakta, bu tabletler havadaki nem ya da mide de hidroklorik asit ile karşılaştığında fosfin gazı ortaya çıkmaktadır. Maruz kalınan doza bağımlı olarak alüminyum fosfit intoksikasyonlarında mortalite oranları %40-80 olarak belirtilmiştir. Bu kadar tehlikeli olan alüminyum fosfit tabletlerinin temininde ülkemizde herhangi bir kontrol mekanizması olmadığı gibi bu tabletlerin kullanımı sırasında oluşabilecek ciddi durumlar hakkında herhangi bir bilgilendirme de yapılmamaktadır. German Jørgensen JR, Rössel PR. Poisoning with aluminum phosphide can be life-threatening for patients as well as health professionals. Ugeskr Laeger. 2013; 175: 1706-7. Mehrpour O, Singh S. Rice tablet poisoning: a major concern in Iranian population. Hum Exp Toxicol. 2010; 29: 701-2. Singh D, Jit I, Tyagi S. Changing trends in acute poisoning in Chandigarh zone: a 25-year autopsy experience from a tertiary care hospital in northern India. Am J Forensic Med Pathol. 1999; 20: 203-10. Siwach SB, Gupta A. The profile of acute poisonings in Harayana Rohtak Study. J Assoc Physicians India. 1995; 43: 756-9. Chugh SN, Arora V, Sharma A, Chugh K. Free radical scavengers & lipid peroxidation in acute aluminium phosphide poisoning. Indian J Med Res. 1996; 104: 190-3. Solgi R, Abdollahi M. Proposing an antidote for poisonous phosphine in view of mitochondrial electrochemistry facts. J Med Hypotheses Ideas. 2012; 6: 32-4. Bogle RG, Theron P, Brooks P, Dargan PI, Redhead J. Aluminium phosphide poisoning. Emerg Med J. 2006; 23: e3. Gurjar M, Baronia AK, Azim A, Sharma K. Managing aluminum phosphide poisonings. J Emerg Trauma Shock. 2011; 4: 378-84. Etemadi-Aleagha A, Akhgari M, Iravani FS. Aluminum Phosphide Poisoning-Related Deaths in Tehran, İran, 2006 to 2013. Medicine (Baltimore). 2015; 94: 1637. Demir U, Hekimoğlu Y, Aşırdizer M, Etli Y, Kartal E, Gümüş O. A case who died due to the suicidal intake of aluminum phosphide. Cumhuriyet Medical Journal. 2017; 39: 458-65. ISNAD Terece, Cem , Soğukpınar, Veysel Osman , Özdemir, Nazım , Polat, Sinem . "Infant Death Due to Aluminum Phosphide Intoxication, An Uncontrolled Insecticide Used : Case Report". 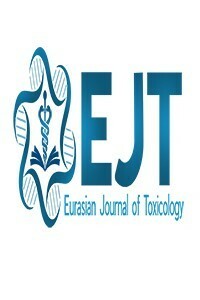 Eurasian Journal of Toxicology 1 / 1 (March 2019): 33-36.